In this age of personal brands, I believe WHO YOU ARE is more important than WHAT YOU KNOW. Information is abundant. It’s everywhere. This means you can’t win by teaching and sharing knowledge alone. Instead, you need to unleash the most powerful took in your possession – your personality. Create a personal brand and use your unique perspective, everyday stories, and authentic voice to stand out, be different, and cut through the competing noise. Be conversational, be real and build your ’know, like, trust factor’. Articulate who you are, what you stand for, and what you believe – and you’ll draw the right people into your world who will want to learn from you, buy from you, and refer likeminded people to you. It’s a potent cocktail and a recipe for impact. If any of the above describes you, then know you’re in exactly the right place. 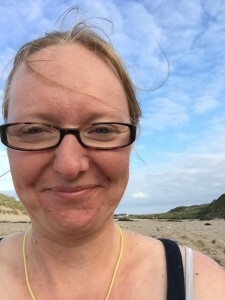 I’m Georgina El Morshdy – a brand communication strategist and copywriter. 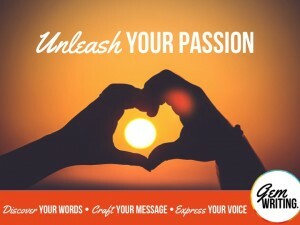 My passion (and purpose) is helping inspired individuals (just like you) to understand and articulate their message – through words – so your vision (and personality) connects and engages with your target audience. I’d love to help you unleash the power of your personality and create the engaging content you need to build a profitable business this year. Tackle ‘messy message syndrome’ NOW! So if you’re ready to show up authentically and use your personality as a marketing tool, download my free PDF now. 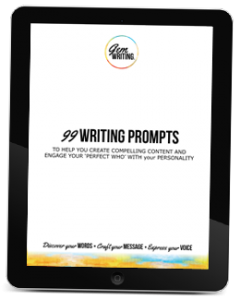 99 Writing Prompts will stir up your creativity and help you inject personality into your content.